We stayed a little close to home today. We took a quick trip down to Alpine to run a few errands and get some Mexican food. The last time I had Mexican food was when we ate Mario's De La Mesa last month so I was ready for some good ol' Mexican food. Al Pancho's is very, very, good basic Mexican food. The food is consistently good and you get no surprises when you go there. We have been eating there for the past 8 years. Always great food and great service. Today the service was totally lacking. Our waitress never came back to ask how were were doing and see if we needed anything else. While we were eating our chips and salsa waiting for our meal some of the salsa jumped off my chips and onto the table so my napkin was pretty much used up. When the waitress arrived with our food, in a timely manner I might say, I asked if she could please get me another napkin as this one was used. She never brought the napkin, I eventually got up and got my own from the waitress station.That was the last time we saw her other than when I finally had to get up and ask for a to go box. 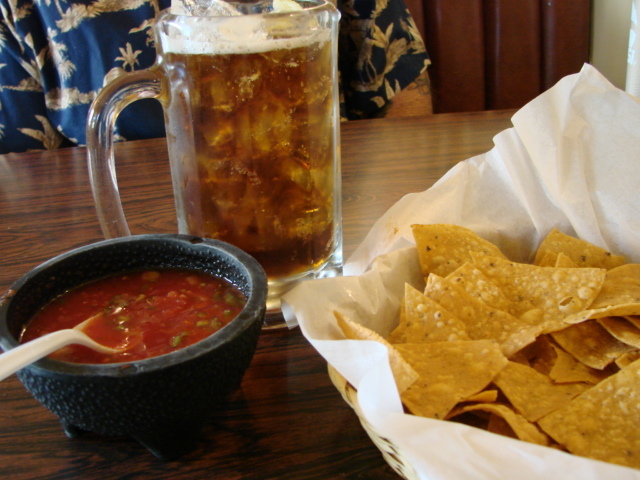 I had a Negra Modelo with those chips and salsa. Yes, I drink my beer over ice, just something I do, gotta have a really icy cold beer. The salsa was flavorful and spicy and the chips were not greasy. Today the food was spot on as always. 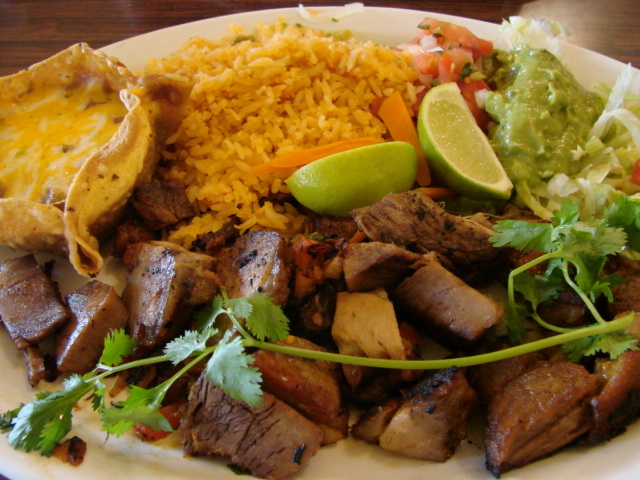 Stan had the Carne Asada plate which is the house specialty. 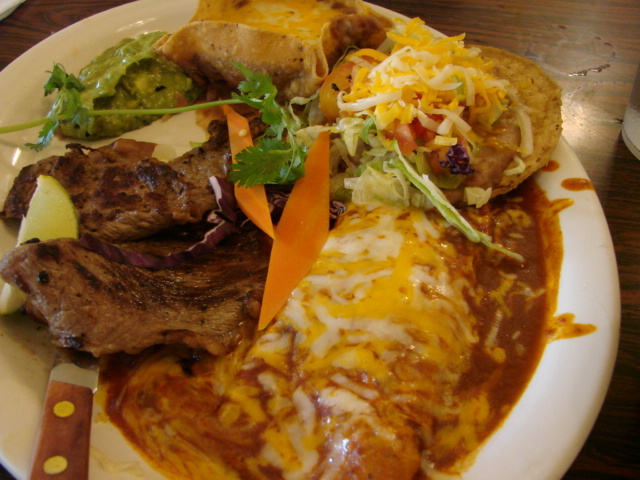 It comes with a cheese enchilada, a small tostada, beans, guacamole and tortillas. What can I say about the Carne Asada. It was delicious, nice and tender. The cheese enchilada was outstanding. 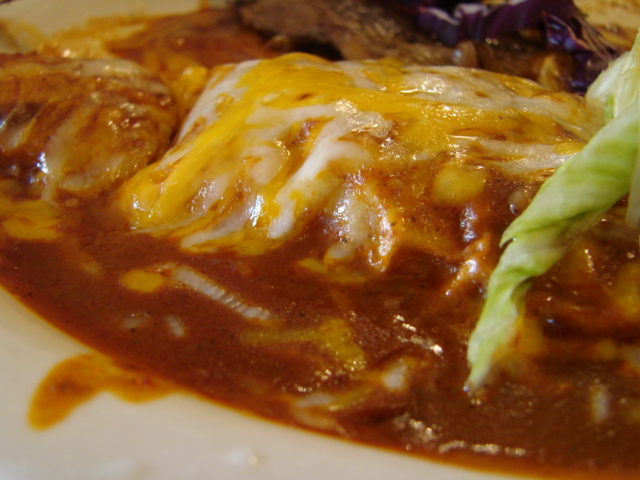 The enchilada sauce was nice and dark and rich and spicy, my favorite thing on the plate. I had the Carnitas. They are served with rice and beans,guacamole and lime wedges and a little chopped onion and tomatoes. Once again their Carnitas were great. 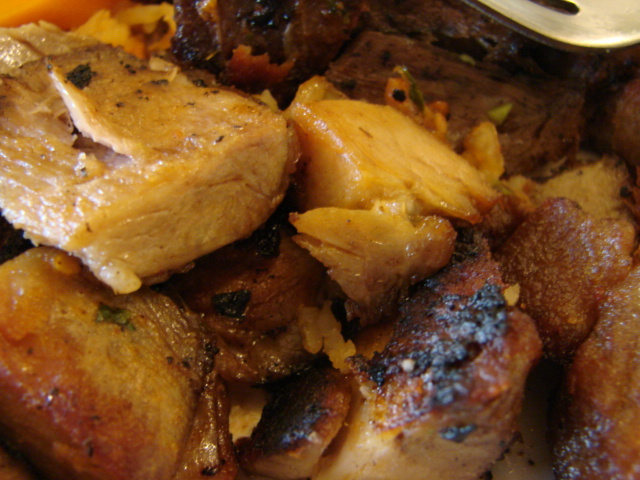 Very flavorful and just the right amount of overdone crispy, crunchy pieces of pork along with the juicy tender chunks of mostly lean meat with a few nice fatty pieces. Sure glad I had enough to bring home for a midnight snack tonight. Their seafood is excellent also. I especially like their shrimp dishes, very well done.